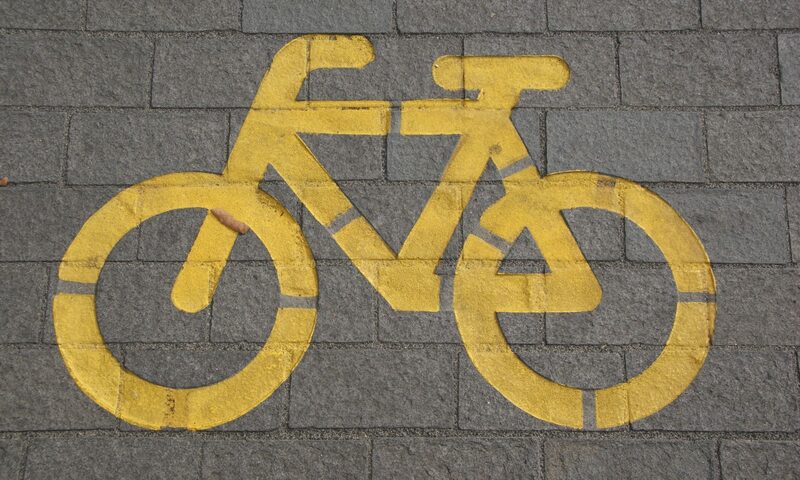 So a few months back we had a really bad few weeks in UK, several cyclists died on our roads in the space of only a few days. The London Cycling Campaign invited cyclists from across London to attend a vigil at the sites of one of the deaths, a location which has been involved in several deaths previously, Bow Roundabout. I attended the vigil and made a short video documenting it and the turn out. As I always do, I put a video up online. The Daily Mail decided to add it to one of their articles, not by using youtube embed but instead adding it onto their system and putting adverts in front of it. The following is my correspondents with the Daily Mail about them breaching my copyright. If so, I’d like to request permission to download it and play a minute or so of it on our website (www.mailonline.co.uk) to go along with the story we’re running today. We will of course credit your YouTube channel. Further to your approach on the 14th November 2013 at 08:29, please provide me with contact details for the appropriate person for me to deal with regarding the unlicensed use of my video on the daily mail site. I sent the above e-mail on the 15th of December, a month after it went onto their website. Why? I was looking at various avenues on how to approach this, and the most cost-effective was to go down the route of pursuing it my self. Lawyers fees would have been over the value I was able to get, the lawyers/solicitors I spoke too were unable to value the claim. I got a response later that day, Daily Mail Employee 1 was off ill, but had forwarded my e-mail onto ‘the desk’. £50? That may be your fee, is it really the industry rate for content? after doing some reading about other people having their copyright breached by the Daily Mail (mostly photographers), they offer £50 for everyone. I joked with friends and colleagues that a video is essentially a series of photos, they used +60 seconds of my footage, so that is a little over £90,000. Without Prejudice Save as to Costs. Thanks for you reply of 16.12.13 at 11:40, I was extremely disappointed to see my video used in the way you have used it. This was a particularly flagrant breach of my copyright because you didn’t wait for my response, you downloaded my video and uploaded it to your own system instead of using YouTubes embed feature and you added your own adverts. You ought to have known that the video would be protected by copyright, and use of my video in this way by you in the course of your business would be a criminal offence under S.107(2A) of the Copyright Act 1988, punishable by up to two years in prison and/or a fine. – I am entitled by law to additional damages where the breach is flagrant or where you have gained a benefit from using the video. – I may elect to require an account of profits from your use of the video, and may require you to carry out disclose of the full amount of profits derived from use of my video. This may include my claiming a share in the total profits from the adverts. – I may be entitled to additional damages for ‘moral prejudice’ under S.3(2)(a)(ii), The intellectual Property Regulations 2006. – I may be entitled to claim from you any additional losses caused to me which results from your breach. – If I have to take this claim further, the costs of lawyers’ fees, court fees and other expenses will also be added to the cost of the claim. The foregoing list is not exhaustive, and I reserve my right to claim for additional heads of damage. In the interests of resolving this matter quickly for both of us I am, at this stage, willing to make a without prejudice offer to waive my rights to damages from you with respect to your breach for a payment of £5,000, provided that you accept this offer in writing within the next 7 days and provided that such sum is received on my account within the next 14 days. This offer applies with respect to your breach of copyright and the usage of my video on your website, and does not in any way imply waiver of consent regarding any additional usage or use of any other video or any breach by any other person. This offer applies to the settlement of your breach of copyright for this video and the further license on the video on your website. Should I not receive notification of acceptance of this offer within the period described above, I shall file this matter with the small claims court. Additional costs may be incurred which I shall expect to recover from you. It’s a smart request, if I don’t say so my self. “Without prejudice save as to costs” is a term that doesn’t limit later values of the claim to the value you put on it in this contact. We do take copyright extremely seriously and waited overnight for your response, however in view of it being a pertinent news story, moved ahead with the edit in the correct manner. So they have tripled the offer from their initial one, I suspect that they are willing to play the long game with this, offer as little as possible and hope those that are making the claim do not have the time, knowledge or assertiveness to push further. I was smart in my previous response, I kept some information back and they fell right into my ‘trap’. As per your initial e-mail to me, you included a copy of the message that Daily Mail Employee 1 sent to me on Youtube. The timestamp for that message was 08:29 14/11/13. You mention that you made a reasonable effort at making contact and left reasonable time for me to respond. A comment was posted on my youtube video at 09:29 14/11/13 that stated that my video was now on your article in the Daily Mail. I believe that an hour is not a reasonable amount of time to wait for a response, not getting a response does not allow for you to break copyright law. I have attached copies of both of those e-mails I got, including time stamps. You mention that you waited overnight for a response, which I have shown to be incorrect, and that this was a pertinent news story and that you moved ahead in the correct manner. Youtube offers an embedding service that allows you to embed videos hosted on youtube into a webpage. It’s seamless, easy to do and has been around for several years. It wouldn’t breach my copyright as it would be my video that is embedded. That would have been the correct action to take without first sourcing a license. After which point we could discuss a license cost and if we came to an agreement you would have been able to add the video onto your system. You added the video to your own video system, and played adverts before it that lasted 30 seconds and where not skippable. My license fee for video footage is £30 per second. This falls within prices that are often seen for similar pieces of work by other videographers, footage is paid for price per second and usually falls within £20 to £60 per second. You used 67 seconds of my footage and this equates to a license fee of £2,010. Due to the flagrant breach of my copyright, as highlighted above, I increased my license fee and added on what I thought you may have potentially made from advertising and an extra cost for keeping the license. This is in line with the Copyright Designs and Patents Act of 1988. Due to the information you disclosed regarding the earnings from the adverts and the fact that you have removed the video. I am happy to drop my fee down to £4,000 but still matching the same terms as highlighted in my previous e-mail. The key there was to be factual and precise. I’m clearly able to prove that they did not allow enough time for me to respond, that there was a way to use my video without breaching my copyright. Breaking down the costs a bit and explaining the basis behind them along with price ranges often used by videographers for footage. Lowering the requested amount in this case shows that you are being reasonable, which is key if this goes to court at a later date. It was not the intention to use the video without giving you reasonable opportunity to respond however as Daily Mail employee 1 is currently undergoing surgery I can only take your account of the time frame based on the information that has been passed on to me. In relation to the value of the content, by putting video on YouTube it can not be said to be exclusive and hence the stated fee is gross excess of what it would be worth. We have offered an accurate account of our profits for advertising and added almost double the normal fee, amounting to £150, an offer which we believe to be reasonable and hence that offer stands. At this point there is no need for me to debate the finer details of exclusivity and it’s value. I’ve made it clear that they are 100% in the wrong. It’s now the Christmas break, the last e-mail from them was on the 18th of December, I left it over Christmas and new year and got back to them on the 3rd of January. You used my video without my permission. I would not have agreed to your usage for the amount that you have offered and you breached my copyright. 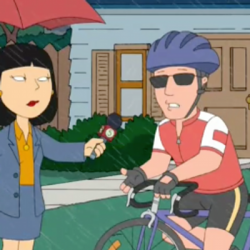 It is therefore appropriate under the circumstances that you pay my license fee. Attached is my invoice for the license fee. If I don’t receive payment within 14 days, I’ll issue proceedings via the small claims court. Any extra costs involved in making the claim, including the cost of my time, will be added to the amount claimed. Including an invoice is an interesting tactic, it forces into through their accounts system and flags up as an issue to people outside of the current circle. Not paying an invoice in time is subject to further costs. Thank you for your emails and previous correspondence with Daily Mail Employee 2 that have been passed to me for attention. We have now had the opportunity to discuss this with the video editor who was on duty on the day your footage was used and agree that your permission should have been received before the video was uploaded. Our usual editorial processes fell short on this occasion and we regret that this occurred. With the above in mind, and considering our usual rate for videos used within a similar context on the site is £80, we are willing to offer payment of £250 in full and final settlement of this matter. We note that this is substantially above standard rates paid for such footage, used in similar contexts. We have also addressed this matter internally with our staff and have permanently removed the video from our website. Please let us know if you are happy to accept this as resolution to your complaint and I will arrange for payment as soon as possible. It seems to be going up the chain, this is an assistant managing editor. Along with going up the chain, the offer is also increasing. However, I still don’t think this is acceptable. I do not respond to this e-mail, instead I waited 19 days and sent the following. I am disappointed to note that you have not paid my invoice in full and I note that you have confirmed your editorial processes fell short and that you agree my permission should have been received before the video was uploaded. It is therefore appropriate that you pay my invoice in full. Failure to do so within 7 days will result in the issuing of proceedings via the courts for the invoice plus costs as previously communicated. A direct and firm e-mail, giving them time over what you initially stated is key if you do take this to court! You need to show that you have given them plenty of opportunity to pay. Thank you for your further email. In full and final settlement of your complaint, we are prepared to pay you £1,000. Please note that if you do not wish to accept this offer, it would be worth our while arguing the value of the copying in court. We will rely upon our correspondence in respect of costs. Please let me know how you would like to proceed. I’m not sure how our previous correspondence will help them in court. The problem I will have is I have nothing to show that my costs are £30 per second, I have not previously charged that. They also did not wait for my response, if I had responded with that being my price and then they breached my copyright, then I would be in a better position to argue my costs in court. However, that does not mean that £1,000 is a bad offer. I was playing along with their game, except I was in a much better position. As I mentioned earlier, I suspected that they would be playing a game where they try to pay as little as possible and hoping that people do not have the knowledge, time and assertiveness to push along with it. There is plenty of other people who have been in just this position and it has been exactly the same. I suspect they regularly breach copyright and just hope that people do not follow it up. But that is the key thing, we must protect our copyright! Now I said on twitter when I was first looking into this that I would donate the money to charity, I was not in this for the money. I wanted to prove a point to the Daily Mail and I felt that no one should make a profit from this. 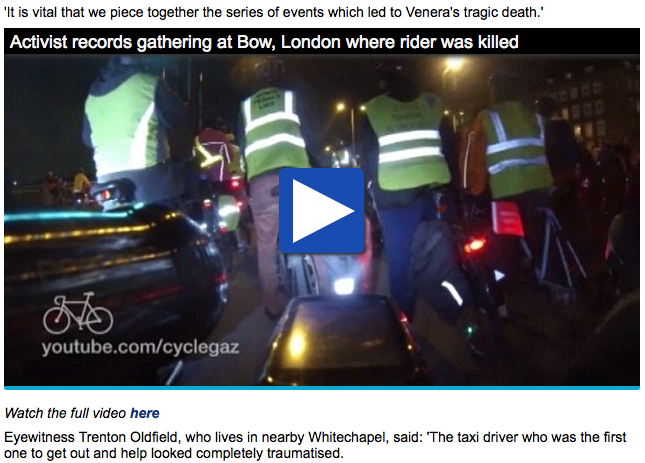 As the video they used was about the cycling deaths we had in London towards the end of 2013 and because it was a film of the vigil that the London Cycling Campaign had for those cyclists at Bow Roundabout. I have come to the decision that the £1,000 shall be donated to them to help continue their fantastic work towards making London a great place to cycle. Due to me working out the tax side of things I have currently not donated the money (I only received payment from the daily mail yesterday), but will do shortly. If anyone wants any advice on how to tackle these situations, please do get in touch, I am more than willing to help others protect their copyright. I had a similar issue when Beady Eye played a secret set at Glastonbury, The Mail borrowed my clip but didn’t embed it from YouTube. I spotted an email from them requesting its use long after somebody texted my girlfriend to say they had spotted her on The Mail website. In my case I was breaching Beady Eye’s copyright so didn’t pursue the matter and at least The Mail put my YouTube URL across the video. This is excellent! Well done for your effort and for your donation to LCC! I had much the same thing two years ago when Sky stole my video and broadcast it on their TV channel. I managed to get £300 out of them for that. I think the key is always to escalate it past the person you’re dealing with and onto the company lawyers. You may not get the thousands you want, but it will be a headache for someone senior and (hopefully) noted come appraisal time. I find it very interesting that these big media companies are quick to try and close down websites they think infringe their copyright and yet are so lazy when it comes to their own attitudes. Very informative and well done for holding the Daily Mail to account. great stuff! NUJ are always interested in hearing about this stuff. I’m a TV producer (which might be completely different) and we’d normally set aside £600 for a good UGC clip, but normally end up paying much less (£50 is a joke though). I’d call £1k a very, very reasonable offer – especially as the footage isn’t that interesting. When we use footage without permission (which is extremely rare) we must demonstrate that we’ve tried multiple times and through multiple points of contact to get hold of the owner and insure against a claim – so I dare say that you’d have a good case to get some money, but I can’t comment on how you’d prove the worth of the footage. Indeed, my problem was always proving it’s worth. There’s only one problem with your arguments: copyright cases are never heard in the Small Claims Court; they are always heard at The High Court, which is why the cost of losing a case is so exhorbitant (legal fees). You, of course, have a cast iron case as to the unlicensed usage, but you would, ultimately, have to be prepared to exercise your rights through the High Court. For more info. google “the true cost of ignoring Getty Images copyright infringement”. For my sins, I once accidentally infringed Getty’s copyright on an image and settled at several hundred pounds for a thumbnail-size picture (I say acccidentally, because the image was in a advert provided by a third party!). Later, I came to enforce my own copyright on borrowed product photography. I never went to court but charged £450 per image (it was glassware and very difficult to photograph well, which is why everyone started using my images instead of the manufacturers!). As such, your amount seems very reasonable and DM’s offer derisory. I knew they would offer a much better offer before it got to court, you just have to use it to scare them. It’s also a reason I sent them an invoice. If it does ever go to small claims court, you just claim they haven’t paid the invoice and then it can be dealt with at a small claims court. Hi I have the same issue myself, dm wrote to me asking if they can use my viral funny clip and I didn’t read that until a I saw it on the daily mail app and also on Facebook. They must have waited no more than an hour. The same goes for the sun and OK magazine. If you had to do it again would you do the same? I think I’ll just send an invoice. Surely the cost should simply be reasonable for 60 seconds of footage which must vary in price greatly. It’s for the person selling the footage to put a price on it, no matter how obscene the amount if they went through the proper channels they could have said yes or no to your price. The worst thing is they ad adverts to it, so not only are they getting hits to their site – they are getting revenue directly from your (and now my) content L.
To make matters worse, my video was momatized so they have denied me revenue which I would have received for all their views if they’d have done it the legal way and embedded my youtube link. I have the same issue with other papers but these aren’t using adverts so not sure if my rights are as clear even though they have legally broken youtube tos. Doesn’t matter if they don’t put adds on it, it is still a breach of copyright and as such needs to be licensed. Adding the adverts is just an added cost for them. Previous PostPrevious Is filtering legal?